HOW TO TRAVEL FROM DA NANG TO CHAM ISLAND? Cham Island is considered as the mother of nature, with its rustic and pristine scenery and large beaches shimmering in the sunlight. Along with the abundant ecosystem of flora and fauna, Cham Island has long been a great destination for people who love nature beauty. Besides, it also has geographical location which is near Da Nang – Hoi An – the famous tourist route of the central land strip. The article will recommend the full way from Da Nang to Cham Island for your trip. 1. How far from Da Nang to Cham Island? 2. How to go from Da Nang to Cham Island? 10. What to eat in Cham Island? Cham Island is a group of islands in Hoi An City, Quang Nam Province. This island is about 50km from the center of Da Nang city. Because the distance between Danang and Cham Island is not so far, you can combine of going to Hoi An and Cham Island at the same time. We are sure that your trip will have full of fun! If you are traveling in Da Nang, on a journey to experience Hoi An 1 day, you can travel Cham Island for 2 days and 1 night to explore for all the beauty of Cham Island. From Da Nang to Cua Dai pier is about 30 km. You just go along the sea to Cua Dai beach, from here continue to go straight further 5km. Bus: You can catch Da Nang – Hoi An bus to Hoi An bus station and then take a taxi from Hoi An to Cua Dai pier. Taxi: In case you do not know the way or want to feel comfortable, you should take a taxi, taxi is the first choice for you. This cost is quite expensive so travel in group will be better. Cars: If you are traveling in groups, you can rent a car to Cua Dai. At the pier, you are assured with overnight car service here. It only takes about 20 minutes for a turn, if you have enough money and prefer a strong experience, choose a high speed canoe. Although the cost is quite high compared to other vehicles, but the feeling of floating in the sea with cano will not make you disappointed with the cost of 120,000 VND / pass. If you travel in the week day, it can usually be 150,000 VND, the weekend may be 100,000 VND because it depends on the number of customers on the canoe. Group travel will save more, cano will start at any time of the day, depends on your request. This means fare cheaper than cano, about 200,000 – 250,000 VND/ round trip. For those who are seasick, do not choose wooden boat for wooden stunt and take more time (about 1 hour). This means less choice. Same as wooden boat, slower moving boat will take you about 1 and a half hour or more. In this way, you only pay 30,000 VND / way which is cheaper than many other means. The boat usually departs from 7:30 am to 8:30 am, depending on the boat’s departure. 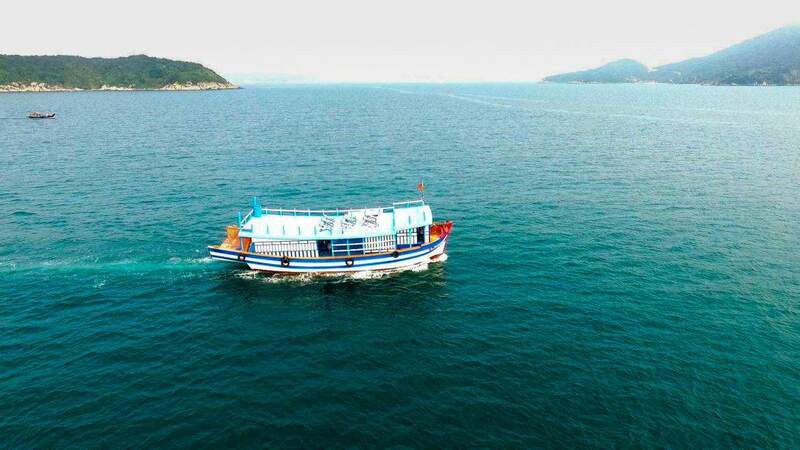 Although this boat is quite inconvenient to leave, it is much cheaper and have more time to enjoy the natural scenery, chat and have fun on the go. If you have enough money and want to save time, you can go by high speed canoe. 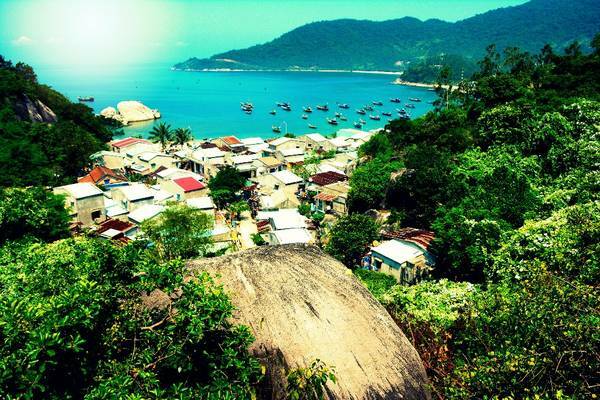 Or simply, you can choose Cham Island one day tour, the delegation will pick up separately from Hoi An or Da Nang. The cost will be included in the package of the tour. The best time to travel to Cham Island is from March to August. At this time, Cham Island beach is calm, peaceful which is suitable for exploring this fascinating land. In other months, when the sea or storm, large waves, boats can not go offshore and the islands are almost isolated, so it is not interesting to come to Cham Island at that time. Motorbike: You can move to Cham Island by motorbike. This is a convenient and active vehicle which is suitable for young people who love to ride long distance motorcycles, take pictures and enjoy the scenery along the way. Boat: You can also visit Cham Island by boat. Sitting on the boat of the people, stamping on the waves, enjoying the sea scene and breathing the fresh air are great experiences. Price is quite cheap, about 500,000 – 1,500,000VND. This is the most crowded beach tourist among all beaches of Cham Island. Ong Beach is located near the Cham Island pier, close to the beach area. This is where the most developed services come with a chain of restaurants, hotels and other travel services. Ong Beach conquers tourists by the beach with turquoise waters, white sand beaches stretching with the trains that are close together and crowded. Come here, you can relax under the green coconut trees, enjoy the fresh and some fresh sea food. This is a fishing beach, not a beach for tourists. 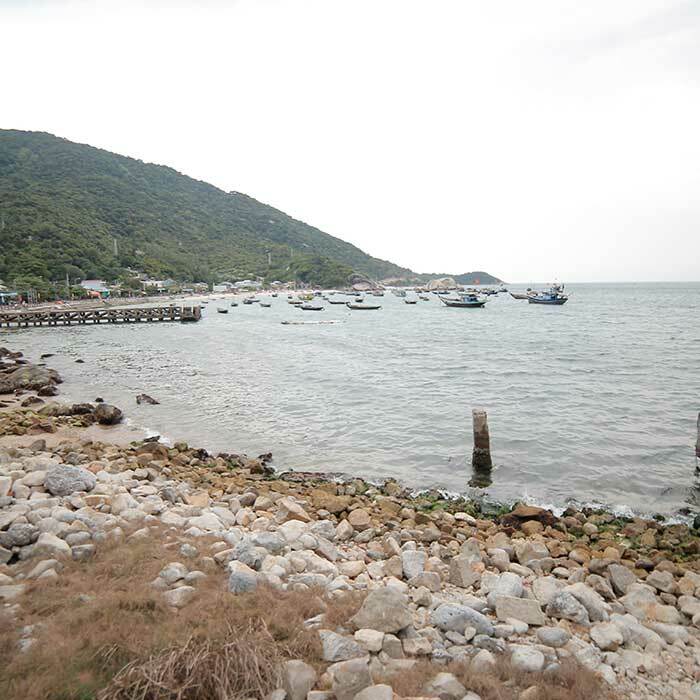 Coming to Lang Beach, you will see a fishing village where fishermen catch the waves. There is a bridge in Lang Beach which is the place for canoe and tourist boats. Facing the sea is a primeval forest with a very thick density of trees, looking from a distance as a giant, fresh vegetation. Chong Beach is one of the most beautiful beaches in Cham Island. It has white sand, fresh beach, green vegetation with natural slurry poured from the mountain down to create the rock with interesting shapes. Because many tourists choose the beach as a place to relax, the tourism here is also highly promoted and developed. More accommodations, restaurants, foot rests, fresh water bathrooms, … are built to meet the demand of tourists. This is not the ideal beach for swimming because there are many boat anchors. However, tourists often come here for fresh seafood. Besides, tourists can also visit the famous historical monuments such as Temple of Nest Village. On 10th March of lunar calendar, the villagers here hold ceremonies and then go to exploit the bird nest. The nature of the beach brings a rustic beauty. Not as popular as Chan Beach, Lang Beach, Ong Beach, … but the rear yards bring good impression of the gentle waves, squeeze the shore and the beautiful coral. Loi Beach is not invested in tourism because this is the main destination for scuba diving tourists. Normally, visitors to Cham Island often visit the coral before going to the beach for bathing and relaxation. In addition to these beaches mentioned above, Cham Island also has many unique beaches like Bam Beach with exotic natural rock formations, Bac Beach with natural caves that few people come to. This is the first stop in thing to do in Cham Island when canoes just land in Cham Island. The museum is divided into two main sections: The first part is to set up a Saab to recreate the whole terrain with different islands in Cham Island. Here you will hear about the marine creatures which are being preserved in Cham Island, Crab Rock, Sea Turtle, Coral, Lobster, … In addition, the room also displays tools related to the daily life of the fishing community. Through this we can understand more about the life of the local in here. This is the only freshwater well on the island, as evidenced by the fact that when people dig wells in other locations, no fresh water is found. In 2006, Cham ancient wells were ranked as national monuments. Situated on the junction of the Cam village residential area, Cham ancient wells are the source of abundant water for the villagers with no water resources ever exhausted. The well is similar to many Cham ancient wells in Hoi An, round tube, round mouth, square bottom, each corner has square pillars with the degree after about 5m. Cham ancient has long become a cultural icon of the people here. There are many interesting “secrets” about the wells which are disclosed by people. When visitors come here who are seasick, after drinking a well of water, they will immediately be healthy and wake up immediately. Hai Tang Pagoda is famous for being a sacred place, a place of worship of the Buddha combined with holy worship to meet the needs of the people on the island. The temple was built in 1758 at the foot of the mountain to the west of Hon Lao Island, which has long been a must-visit destination when traveling to Cham Island. This is the place where people, tourists come to ask for fortune, trade smoothly, many talents. From far away, there is the statue of Buddha Guan Yin which is worshiped in the middle of the gate. Next is the three-door gate with three entrances to the main temple. Inside the pagoda also preserve many intact with the lacquered boards, the red sentences, prominent three large Buddha statue made of wood with facial expression, words, magnitude. A prominent architecture of Hai Tang pagoda is a bronze bell, a relic present for the history and culture of that time. That is why, Hai Tang Pagoda is a place to provide information on the history as well as the outstanding culture of the people here. Tan Hiep Market is located next to the wharf next to Lang Beach. 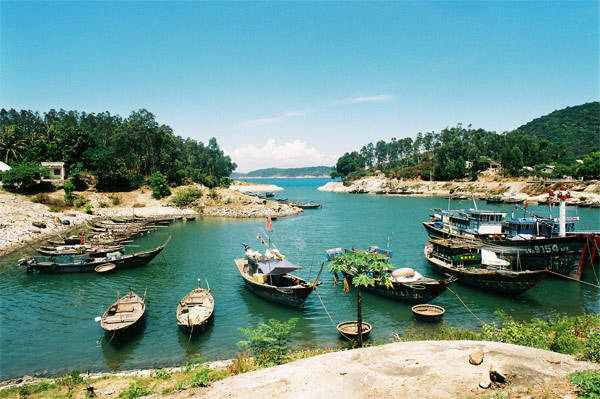 The outstanding products here are fresh seafood, forest specialties and souvenirs for tourists. Tourists coming to Cham Island must visit here, they can choose the most delicious seafood, and can buy gifts for relatives and friends. The goods here are extremely rich, special, price is not too expensive. 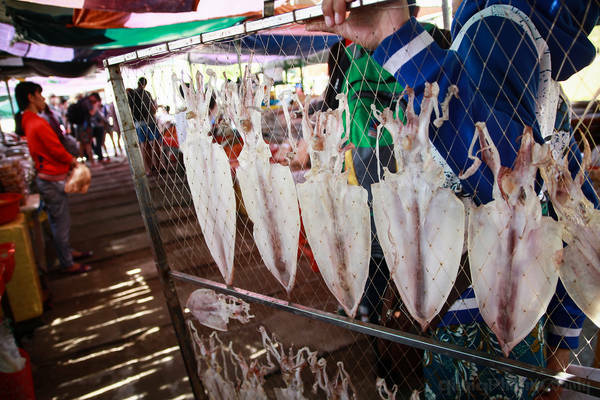 Tan Hiep Market consists of two main areas: The outdoor area on the wharf that sells fresh seafood has been transported from fishing vessels filled with shrimps and fish. The most sought-after tourist seafood are Cham Island crab, lobster, scallop, dried squid, … Tourists can freely choose the food they like best, even taste before buying. The flea market is filled with the smell of the sea and the buzz of buyers. The area of ​​Tan Hop is a world of everyday necessities to souvenirs filled with the sea. A special feature of this market is “The only market that does not use plastic bags.” According to a shopkeeper in the market, people in the village do not use plastic bags to pack instead using newspapers, paper to pack. 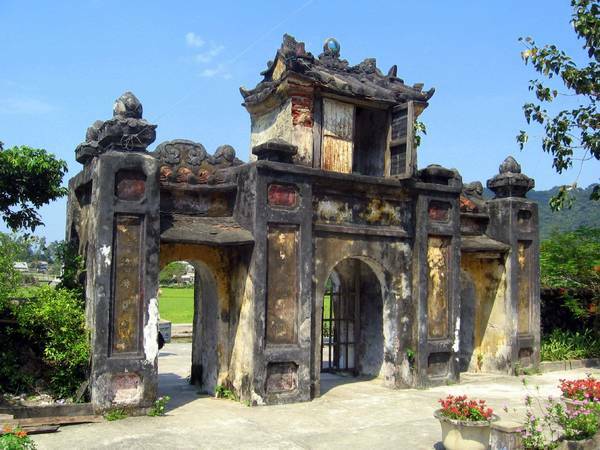 Bird Nest Temple is in Huong Beach, Cham Island which was built in the early 19th century to worship ancestors of the nest. The reason for this special occupation in Cham Island is that it is the only place in the province of Quang Nam to have a bird nest. The temple has long been a cultural feature of Cham Island. . Every day on March 10th of lunar calendar, the people held a ritual ceremony to prepare for a harvest season. Cham Island Island is home to many beautiful coral species and is extremely rich in shape as well as species. 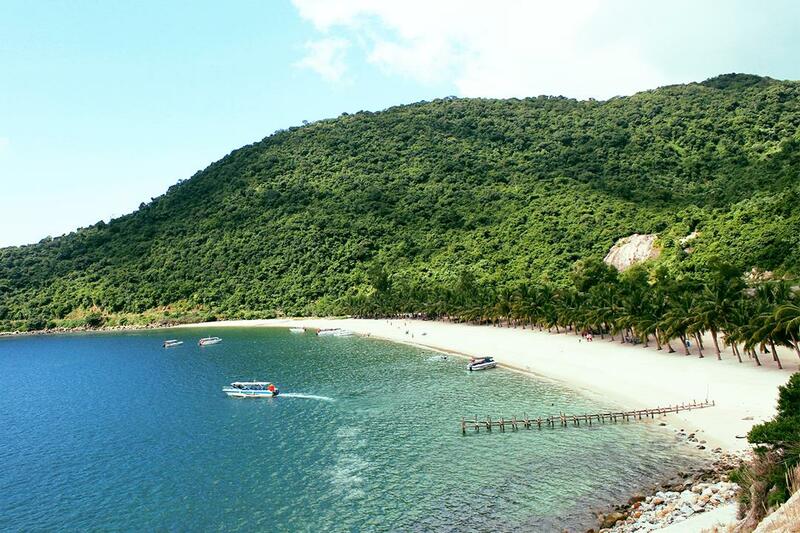 Visitors to Cham Island Biosphere Reserve will have the opportunity to experience trekking and coral viewing. The most coral in Cham Island is Hon Dai with large boulders, stacked on top of each other to form a strong rock embankment. There are two forms of coral viewing in Cham Island: shallow diving and deep diving. Tourists will be fully equipped with life jackets, snorkel, diving equipments. 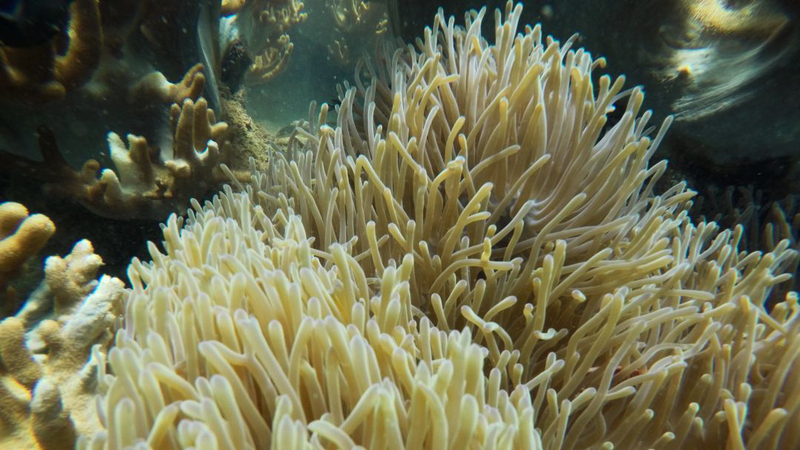 In the form of a shallow diving, visitors will be observed coral at a depth of 3m, just face down to the water is able to admire the natural picture under the colorful sea. For those who want to experience. A more realistic, more adventurous one can choose to dive deep at depths of 6 meters above sea level. Each person will have an accompanying instructor and be taught the necessary gestures in the event of an underwater incident. When diving deep into the sea, you can touch the coral reef, enjoy the floating in the water with the fish swimming around you and more can directly walk under the sea! During the tour, fish of all shape and colours, local marine life will surround you. You will have a delicious lunch and relax at the Unique ecological Bai Chong beach of a Word Biosphere Reserved Cham islands recognized by UNESCO. Experience the adventure on our VietNamese wooden boat. Snorkeling, swimming, relaxing during the tour. Our tour begins at Cua Dai wharf by Vietnamese traditional boat. It takes about 1 hours. On the deck, you have time for relaxing, sight seeing. At the location, the Guests can swim, snorke and join in “Walking underwater Tour“. Then, we will move to Bai Chong beach by a small boat. Having a lunch, after lunch, guests can swim or just relax in the hammocks. The tour finish around 3pm. With a beautiful natural scenery dream with ecological green trees, you can not miss the chance to go to Cham Island by motorbike. The road on Cham Island is quite shocking, so find yourself a steady driver for the trip. You can ride the motorbike on the hills, the mountain pass, watch the blue sea with the surfing waves on the white sand. With a system of islands and beautiful beaches, visitors can choose to visit Cham Island by boat. Dive on the vast ocean, enjoy the four-sided nature embrace and relax in a fresh, pleasant atmosphere. A boat will carry about 10 people, the price of a tour in the morning or afternoon is 600,000VND. Cham Island boat trip will follow the route to visit Ba island, Yen island, diving to see coral and bathing. There is a very interesting game that is boat trip in Huong Beach. 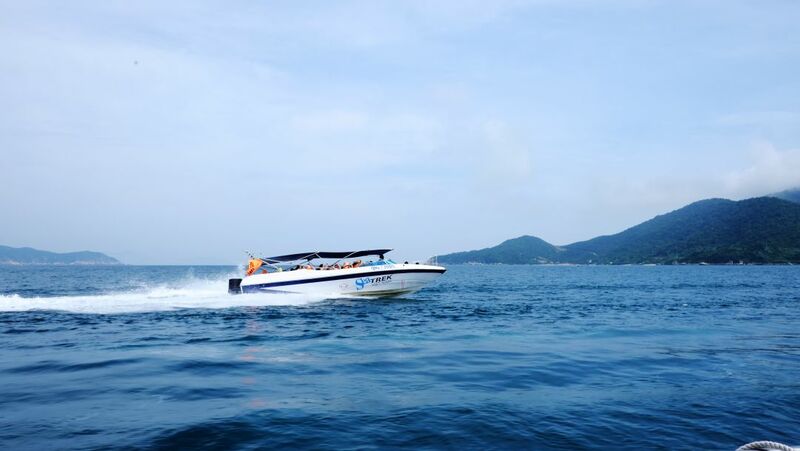 Here you will experience the feeling sitting on a basket boat, a familiar boat of Cham Island! For those who have never been to a basket boat, this is a must try on your travel itinerary. Cham Island is known as the bird nest country. Just take a few minutes to the boat, you have the opportunity to set foot on the Bird Nest Island. The oats are harvested to make salanganes or nests which are rich in nutrients and very healthy. 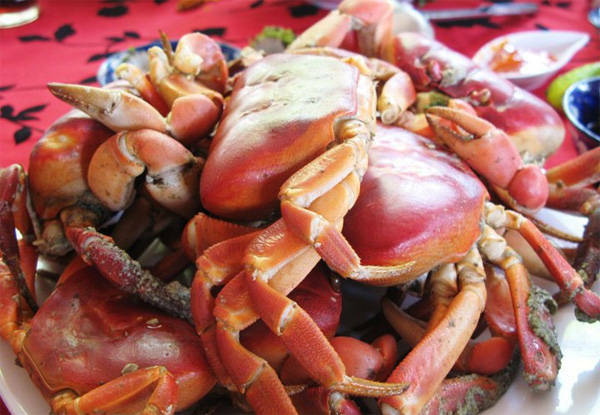 Rock crab is a specialty in Cham Island that any traveler would like to try. Why are rock crabs so special? Rock crabs do not live in the water but live in mountainous forests in Cham Island, where their daily food is leaves and roots. Living in the forest like that, but when it comes to breeding season, rocky crabs pull together into the sea, to the rocky areas to lay eggs, and when the eggs hatch, the crabs will come together to shore up as other crabs. . In order to catch these crabs, people have to skillfully hunt at night when the crabs start to eat and sell in the port market in the early morning. Rock crabs are crabs that have a lot of solid, fatty brick. The crabs are big, full of meat, 100% crab bricks. The “crabs” weighing is around 300 – 500g. If you visit the market in Cham Island, you will see a ton of squids which is sold a lot and this food is popular with many tourists. The local will choose fresh squids from the sea then leave them under the sun. The sun is crispy. The sun-dried squid, with the taste of dried squash but you still feel the freshness of the sea scent. Abalone is a rare species of snail, rich in nutrients, delicious and can be processed in different types. To catch the abalone for your meal, the fishermen have to dive deeper into the sea, searching for and separating the abalone aboard the rocks. Depending on the taste and needs of each person, the abalone is processed in different ways such as boiled, fried, steamed, … Sardine crispy, delicious, eaten with salt, lemon pepper, simple but The taste is extremely strange mouth and attractive. A very good dish to try is the grilled abalone. They will cook it with ginger, garlic, pepper, chili, and then baked on a charcoal stove until the snail’s mouth is boiling and scented. 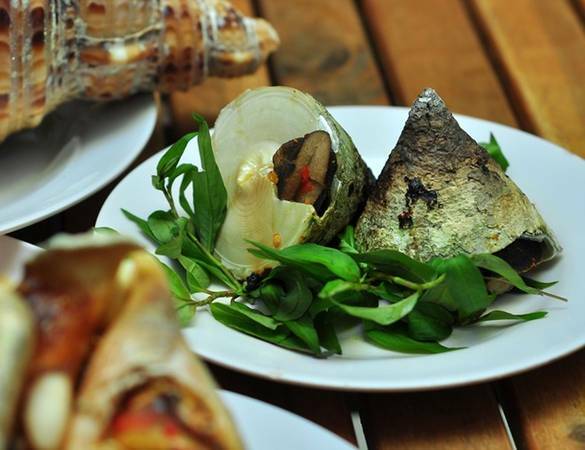 Owing to a very special name, Vu Nang snails has a distinctly pyramidal shape, on top of which is a small knob and shiny black pear-shaped shell. The bigger the shell, the darker the shells are. The process of capturing the conch is extremely complex and difficult. Sea dwellers must dive and soak in water for several hours, using a knife to separate each snail clinging to the rock beneath the seabed. A delicious, attractive dish is the result of labor hours for many people fishing in the sea. Vu Nang snails have a variety of processing options, the simplest is the boiled it. When boiled snails, you do not need much water, but the water itself in the snail is enough to boil it. When cooked, the meat shrinks and turns yellow. People eat snails with lemon pepper. Cham Island forest grows on the foothills, banks, rock slabs, … With delicious taste, Cham Island wild vegetables will be the most important thing of the people here as well as tourists. Cham Island is known as the kingdom of bird nest, so bird nest became a specialty food here. Salanganes nests increase the resistance for humans, blood gas, panic, nervous stability, anti-aging. The new yolk is white, fleshy and tough, but by the action of not quickly clotting, turning white opaque. Because of the benefits, use of it, bird nest has a relatively high cost. With oats harvested from the island of bird nest, the price will vary between 8 million – 12 million VND / 100gr, and with oats harvested in the nest will cost about 3 million – 6 million / 100gr. 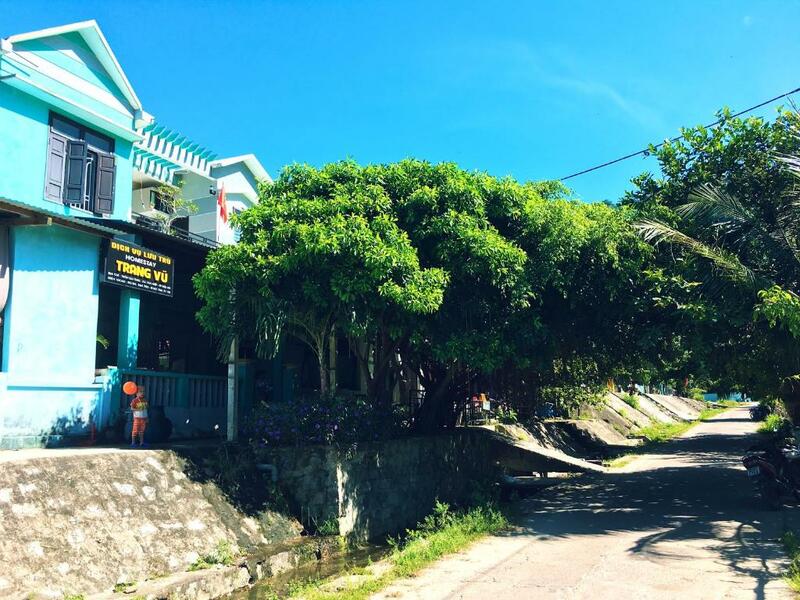 Hammock homestay is located in Beach Lang, Tan Hiep, just a few hundred feet away from Cham Island. This is considered the best homestay Cham Island in terms of quality as well as service. The space is beautifully decorated to create a sense of party and comfort for visitors. Homestay also serves delicious and unique dishes in Cham Island. You can contact Ms. Linh-0976.605.750 to book room. Beach Huong Cham Island homestay is located in the heart of Huong beach. The mind is designed in a single house to make the guests feel more comfortable. You will be equipped with homemade mosquito controllers, fans, etc. Especially you can organize cooking at Beach Huong Cham Island homestay. You contact 0988.030.988 to book the room. Trang Vu Cham Island Homestay is located in Tan Hiep commune in Quang Nam province, 1.7 km from Cham Island. The service is also good, the room is equipped with television. BBQ homestay is also very interesting. The scenery around Trang Vu Homestay is extremely beautiful with majestic mountains or romantic garden. The phone number for the book room is 0167.766.3100. Cham Island is still wild, so this beautiful island does not have a resort or hotel, so visitors often choose homestay to rest. However, if you want to have a comfortable, free space, you can go to the resort or hotel in Hoi An to rest. The hotel is located in Dong Xanh, Thanh Binh Hotel, Huy Hoang Garden, Sunshine Hotel,… These hotels are of good quality as well as good service. In addition, there are many homestays mainly located in the center of ​​village and some neighboring areas. If you do not follow the Cham I sland tour, you can contact the homestay directly. The price is from 100-200.000VND / person or 300.000VND / room for 2 people. Homestay rooms are equipped with basic amenities which are comfortable for guests. 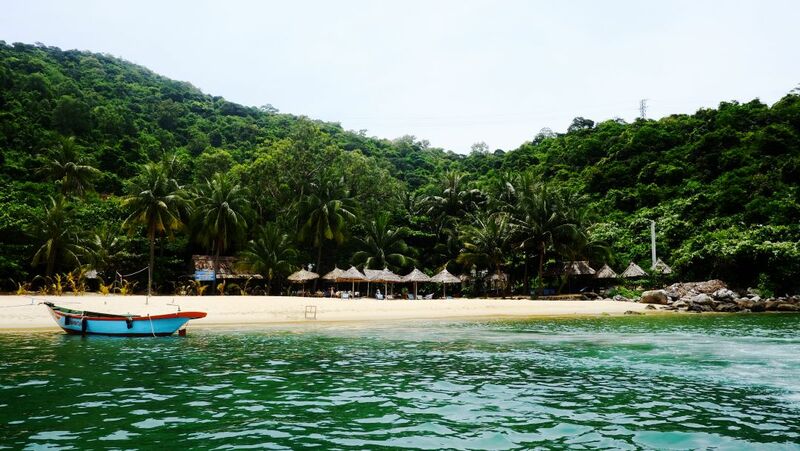 In addition, there is a full complement of services for guests such as: food service, laundry, motorcycle rental, tour guide, boat hire, … Local people are enthusiasm, hospitality who will make visitors enjoy and feel comfortable as a family member. Hope these addresses will satisfy tourists when traveling in Cham Island. 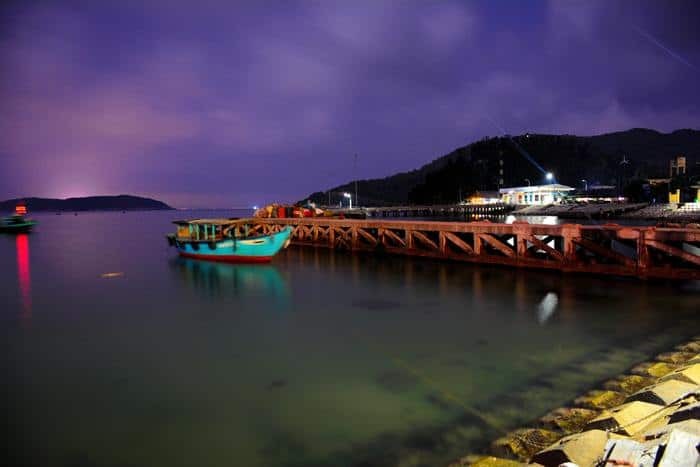 Tourists can also have a chance to have a private and quiet space in the sea of Cham Island, watching the sunset on the slope of the afternoon, dawn on the sea in the early morning, walking to watch living here, temporarily putting aside the worries of daily life. Hope you have a memorable moment, a trip with a great experience on this beautiful Cham island.